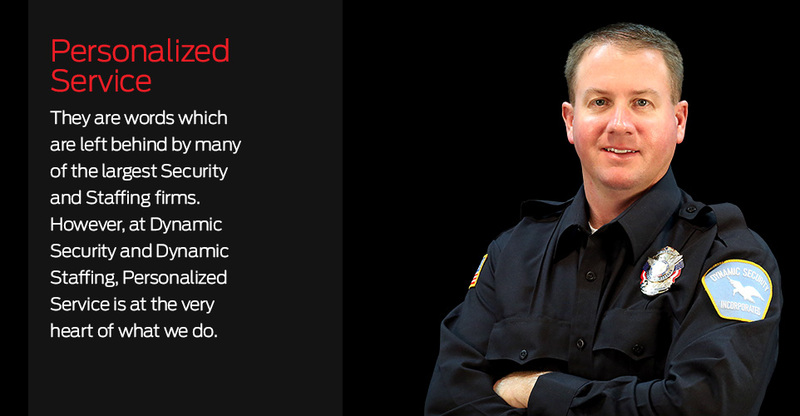 Dynamic Security Inc. is dedicated to securing your peace of mind. Since 1940 Dynamic Security, Inc. has been providing the finest standard of security services to a wide variety of clients. We believe our record demonstrates our firm commitment to excellence. Our clients entrust the safety of their employees, their facilities and their information to us. At Dynamic we view that as an awesome responsibility and work very hard, day by day, post by post, to earn that trust. We would appreciate the opportunity to earn yours. Dynamic Security, Inc. has established a reputation founded on our accomplishments. This reputation is reinforced by the fact that Dynamic Security, Inc. has among the industry's highest employee and client retention rates. Our success over the past 70 years is based upon the relationships we have established and maintained with our employees and our clients. We believe our commitment to excellence is the Dynamic difference. Dynamic Security, Inc. is a leader in the Security Industry, forging ahead by fostering unprecedented communications between management and clients. But Dynamic doesn't stop there. Read more about our range of security services HERE. 1102 Woodward Ave. Across the U.S.A.
Site contents © Dynamic Security Inc. The Dynamic Approach is a complete, unique way our company has developed in order to bring you the best possible service. Read more about The Dynamic Approach HERE.